Cauliflower Tater-Tots – The other white veggie! This Labor Day Weekend turned out to be a memorable weekend. We gathered with our friends on Saturday for a BBQ and we reluctantly celebrated the last unofficial weekend of the summer. I brought cauliflower tater-tots as an appetizer. We also attended the last Hot Air Balloon Classic at Memorial Park in Colorado Springs, CO after 38 consecutive years. Since it’s the last balloon classic, we made it a point to attend. We hopped on the Harley and headed out at 5:25am on Sunday. The morning was warm and still, perfect weather for hot air balloons. We arrived at the park just in time for the 6am balloon launch and found a great spot to park the bike right across the street from the staging and launching area. 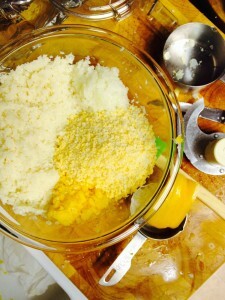 A very tasty "tater-tot" made from minced cauliflower, onion, yellow bell pepper, egg and breadcrumbs Delicious! Perfect Appetizer. 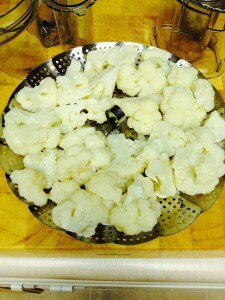 Steam cauliflower in hot water for 3-5 minutes or until nice and soft, drain. 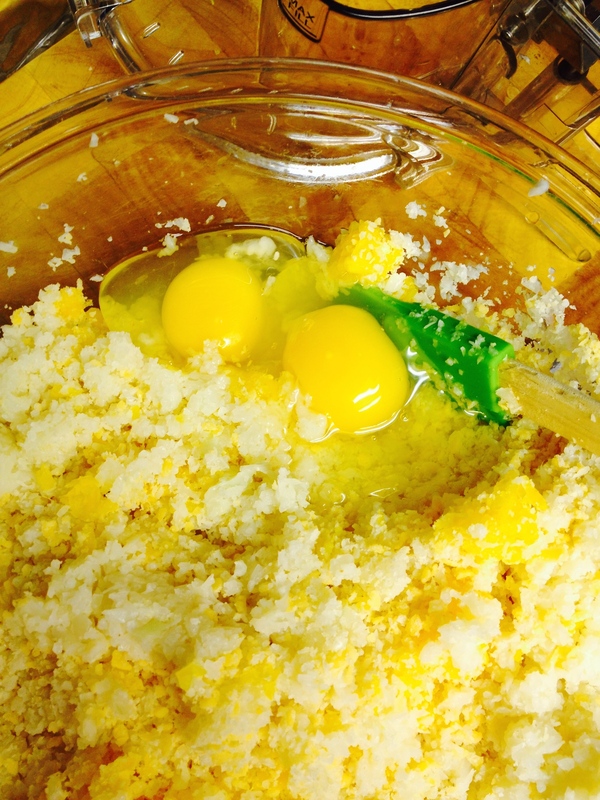 In a medium bowl, combine the minced cauliflower, onion, bell pepper and breadcrumbs. Add the eggs and mix to combine and add salt and pepper to taste. Add the cheeses and parsley. I chose to mince every ingredient with the food processor to mimic an actual potato tot as much as possible and kept the ingredients colorless so the kids at the party would give these "tots" a real try and not be scared off by the "green things" in the tots. Also, when processing the bell pepper it will become very watery. Be sure to press the minced pepper between paper towels to press out as much water as you can. There were a good number of vendors there and quite a few food vendors, as well. Everything from BBQ, kettle corn, beignets, nut carts and funnel cake! 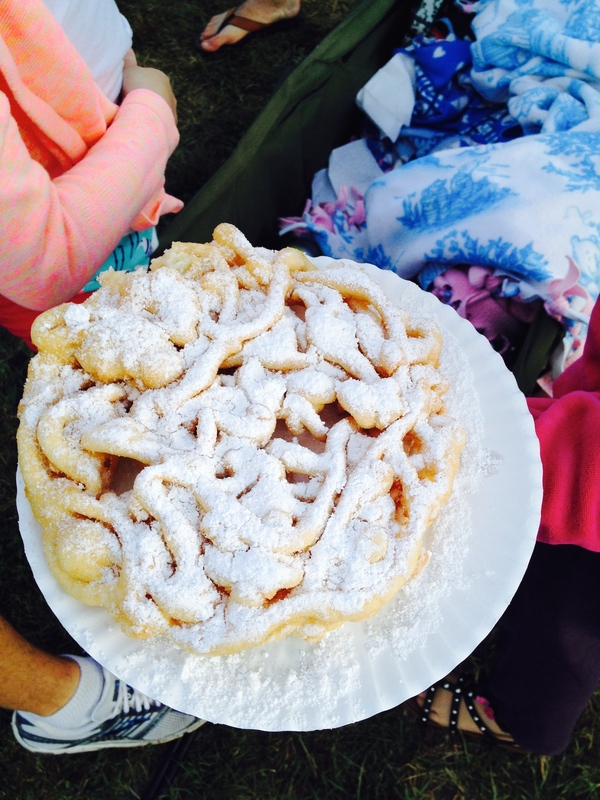 Since we already had our doughnuts fix from Amy’s Donuts, we had to pass of the funnel cake. It seemed like every other person walking around had funnel cake in their hands. That powdered sugar mess looked so good! The final “test” balloon was sent up into the air and the officials watched the balloon glide smoothly southward. It was then when they announcement the “OK” for pilots to launch their hot air balloons. It was amazing that you were permitted to stand right next to the deflated balloon and watch the team prepare for balloon for hot air. The balloons sprang up quickly and we were surrounded by their huge presence, color and glory. It was a sight to see! Definitely a memorable experience. 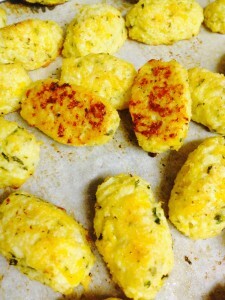 So, back to the cauliflower “tater-tots.” I was looking for a low-calorie veggie side and came across this recipe from Layla at the Brunch Time Baker. 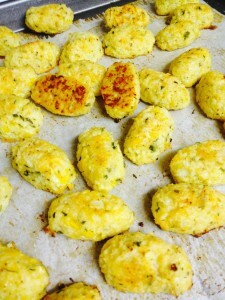 I had made cauliflower mashed potatoes but haven’t thought about making “tater-tots” from them. 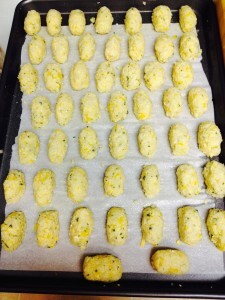 So, if this recipe turned out well, I could bring them to the BBQ as an appetizer! Perfect. Well, they came out great. Except that I forgot to set the timer half-way between baking to roll them over. So, mine were a bit crunchy on the bottom, but they were still quite good and a hit at the BBQ as they were completely gone. The kids liked them too. How can you not like a light and airy tot with a hint of cheddar and parmesan cheese? Not many. This is a definite keeper for my recipe collection. Thanks Layla at Brunch Time Baker. See the original recipe Cauliflower Tots. 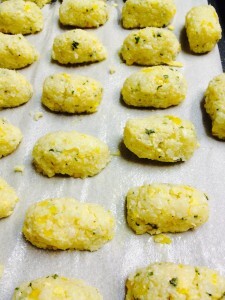 These cauliflower tots disguised as "tater-tots" are very flavorful and have a light and airy consistency about. 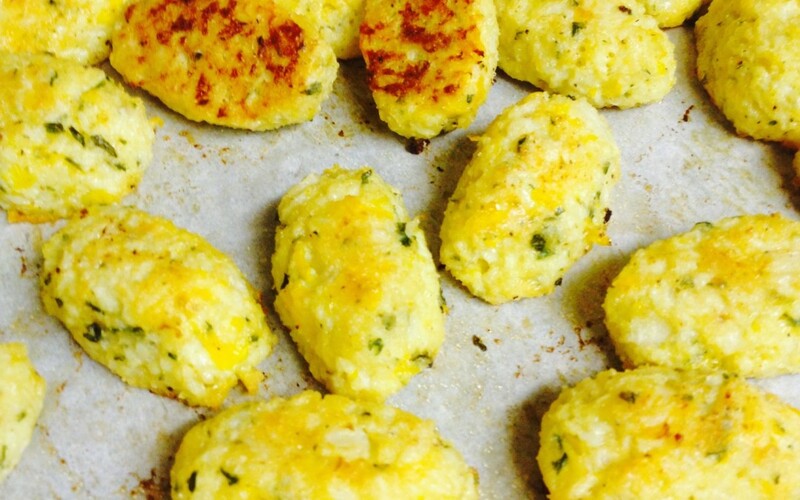 Kids will love them and never know that they are made from cauliflower. Step 1 Preheat oven to 375°F. Spray a nonstick cookie sheet with cooking spray or lightly grease with oil. Set aside. 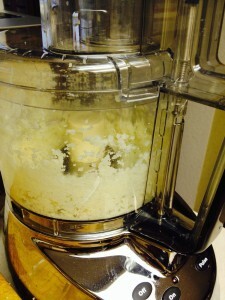 Chopped with a knife or blend in the food processor for just a few seconds. 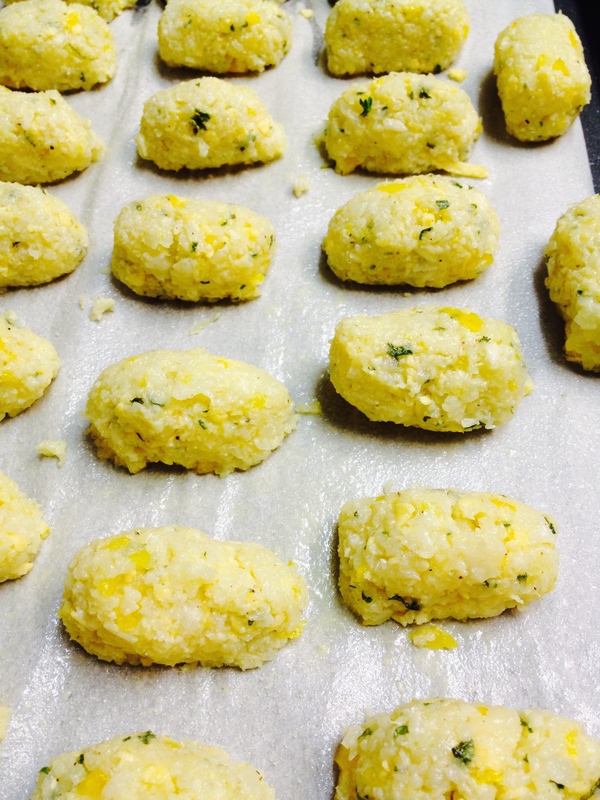 Measure 1 tablespoon of cauliflower tot mix and shape into a tot, pressing mixture together somewhat firmly to hold its tot shape. Place on the cookie sheet ½ inch apart. and bake for about 20 minutes, turning halfway through cooking until golden. Bake for about 20 minutes, turning halfway through cooking until golden. I’m not eating wheat, what can I replace the bread crumbs with, or can I leave them out altogether? Hi Lisa! You may want to try a rice or corn cereal for texture and crunch – use a food processor to refine it down a bit. Let me know how it works out! Good Luck.